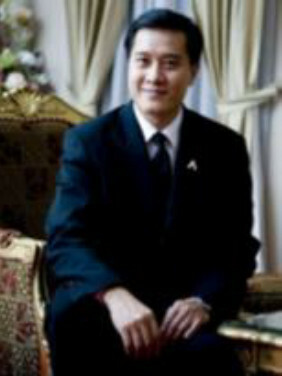 Weerasak Kowsurat, formerly served as Thailand Minister of Tourism and Sports, who later became Chairman of the Board of the Sports Authority of Thailand and also Chairman of the Board of the Tourism Authority of Thailand. His political experience includes Deputy Leader of Chartthai Political Party, Vice Minister for Culture and Vice Minister for Social Development and Human Security. He once served as Deputy Secretary-General to the Prime Minister in International Affairs. Twice elected Member of Thai Parliament and was recorded the youngest Secretary to the President of Thai National Assembly who ex officio Speaker of the Senate and Chairman of the Constitution Tribunal at the age of 24. Received an honor when finished his Law degree (LL.B.) from Chulalongkorn University in Bangkok, Weerasak later graduated with a master’s degree of law (LL.M.) from Harvard Law School in the US. Voted Man of the Year in 2004 on International Women’ s Day by Gender Equality Promotion Association and received an outstanding Executive Award from UNIFEM for promoting campaign to stop violence against woman & Children in the same year, Weerasak was also announced Child Rights Protection Ambassador by the NGOs children protection working committee. Weerasak had also been Executive Director of the International Institute for Trade and Development (ITD), a public organisation jointly established by UNCTAD in Geneva and The Royal Thai Government. At present, Weerasak is Secretary-General for the Federation of Thai Film, Motion Pictures and Digital Contents Association. He also serves as Chairman, Board Member and Advisor to Boards of Directors of many corporations such as International Law Office, automobile maker, oil refinery flow technology service provider, etc.